Located in the Centre of Valkenburg, at the foot of a historic castle in The Netherlands, Restaurant Sunndays partnered with Bluegg (a Six Seconds Preferred Partner) to improve the guest experience. Training blended emotional intelligence, body language, and hospitality expertise in team building training. As a result employee engagement increased, guest satisfaction improved, and revenue increased substantially. There was a need to get insights about the current situation during the program and reflect on what works when it comes to guest experience and their leadership. How effective are we managing our people? How well are we performing as a team? Ultimately, it’s about the people-side of the organization. Team Sunndays wants to continuously evolve in connecting with their guests. How? One key: connecting and collaborating with each other. Being a team by improving cooperation, communication and commitment. Emotions drive people, so emotional intelligence plays an important role in this process. By increasing awareness and skills with emotions… with reading and responding to people, could a custom training program build teamwork and improve the guest experience? Beginning 2016, we, Bluegg, had a conversation with the owners of the restaurant Sunndays about how training can improve hospitality. 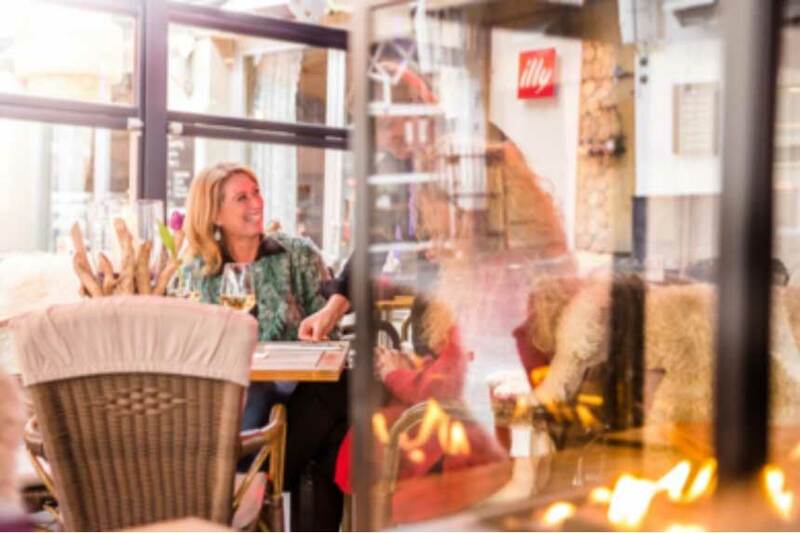 Sunndays is located in the Centre of Valkenburg, at the foot of a historic castle – ruins with a lovely terrace that is known in Valkenburg due to its location, quality, good service and the most hours of sunshine in the city. In this beautiful area we had our conversation about Sunndays’ positive development as well as the difficulties they experienced as entrepreneurs. They envisioned growing further by building a team that is capable of providing guests with an optimal experience in their restaurant. Emotional intelligence (“EQ”) plays a key role when it comes to being successful in the hospitality sector; guest must feel care and warmth, even though it’s a stressful job. Multiple studies have demonstrated this, as well as the relationship between emotional intelligence and leadership (see: 6seconds.org/case). Together with Sunndays we set up a custom program in which EQ will play an important role. Furthermore, we will use our expertise in the area of hospitality and body language during this training program. The following pages tell the story of the program components and the final results of this innovative solution. The program started with a Mystery Visit and our findings were included in two training sessions focused on hospitality. In these sessions, there was a lot of attention paid to non-verbal communication. More knowledge of body language increases your emotional intelligence. If you know the meaning of body postures, of your own, and those of your colleagues and guests, you can be more effective in responding to it. It also helps you to discover which poses work for you and which don’t. The phenomenal first impression is very important in hospitality. This is an essential moment that will give your guest that feeling “I’m welcome.” In the training program we worked with specific poses for hospitality. At the end of the day everyone made his/her own plan of action and put it into action the first day at work. Another important part of the training was complimenting. Giving compliments has a positive effect on people and yet we do it far too little. In the two follow-up sessions, we were focusing on the team. In a team building session we used our EQ Team Dashboard. Each team member received his or her own “Brain Profile” and “Brain Talents Profile.” These brain profiles helped the participants to get more insights into themselves and their colleagues. This awareness helped reinforce mutual communication and understanding for each other’s comments and/or decisions. By deploying the EQ Team dashboard, Team Sunndays has discovered their talents and the aspects where development is possible. The “Brain Talents Profile” uses the 18 most important talents for the future. Grounded in research, these talents are essential to flourish in complex times – at work, in school, in life. Two of the top talents for Sunndays were Adaptability and Problem-Solving. With an inspiring exercise full of FUN, the team finally determined their factors for success: which factors are going to make sure that customers of Sunndays are getting service that exceeds their expectations. We combined these factors with the talents that are already present in the team. With these insights, the team went back to work. The program consists of a number of ingredients. Body Language for Hospitality – Bluegg is Leading Partner at the Centre for Body Language. We integrate our expertise of body language in our (mostly tailor made) training programs. Emotional Intelligence – Bluegg is Preferred Partner at Six Seconds – The Emotional Intelligence Network. We are certified in EQ assessments on a individual, team or organizational level. The results of our cooperation with Sunndays are very positive. An impressive result achieved by the people of Sunndays. With the use of their talents, enthusiasm, commitment, and expertise they provide a unique guest experience. Guests like to come back and they become ambassadors (loyalty). This has led to a 25% increase in revenue. Dagmar and Ellen will now continue because standing still is not an option. The follow-up process is already planned: an EQ Leadership Assessment combined with an individual leadership program. Assurance of current developments is important and they want to improve their leadership skills to provide optimal support and help for their team. “Keep on developing and provide the best quality and experience that exceed the expectations of the guests.“ This was what Dagmar and Ellen wanted to achieve. We succeeded! Guest ratings are very positive; reviews on Facebook, Tripadvisor etc.. confirm this. Guests are praising the warmth of hosts and hostesses of Sunndays. Mutual understanding among team members is excellent. They take care of each other and compliment each other much more. Engagement within Sunndays strongly increased. The enthusiasm and the atmosphere in the team has improved. People feel and express their engagement and employees show more ownership. Also Dagmar and Ellen indicate that they personally have grown and that they both benefit from this program- in their business and private lives. Restaurant Sunndays has welcomed more guests in the past year. There is clear growth in the number of customers who come back more often (loyalty growth). Eventually, this led to a return customer increase of + 25%! I always love seeing a talented individual, finding ways of implementing EI into an existing business where a few loose screws can have a significant impact. In this case, EI. What’s great is that the effects are rippling throughout, so guests will most likely share their positive experiences due to the EI led behaviour, with their friends, families etc. Well done!